Before Pill Glide, I would cut my pills into little pieces to help with getting them down. Pill Glide has allowed me to swallow quickly and easily. Millions of people around the world have difficulty swallowing their medications, vitamins and health supplements. Pill Glide, from FLAVORx, addresses this problem by helping people swallow the tablets and capsules they so often struggle to take. Older adults, taking multiple medications daily, seeking a break from the hassle of swallowing so many pills; and the list goes on. "I have difficulty swallowing pills," says Linda Sharp, one of many satisfied customers. "Before Pill Glide, I would cut my pills into little pieces to help with getting them down. 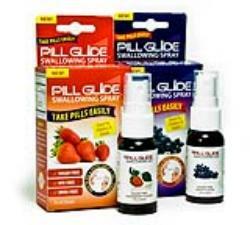 Pill Glide has allowed me to swallow quickly and easily." Linda's experience taking pills and tablets before using Pill Glide is not unique. In fact, polling data reveals that a full 40% of adults have had difficulty swallowing medications at some point in their lives. (Harris Interactive, 2004). With Pill Glide, FLAVORx is tackling this serious issue head on. "Taking what we've learned from our 14 years of experience in the pediatric prescription flavoring world, and recognizing the tremendous need for a product that will help people of all ages take their tablets and capsules, we're confident Pill Glide can improve the quality-of-life for so many people," said Stuart Amos, CEO & President of FLAVORx Inc. Pill Glide is a water-based liquid that is sprayed directly into the mouth. The spray coats the tongue and back of the mouth, helping pills, tablets and capsules easily slide down the throat. To help the wide range of people who struggle to swallow tablets and capsules, Pill Glide comes in two popular FLAVORx flavors - from child-friendly grape to the more adult-pleasing strawberry. All flavor variations of Pill Glide are sugar-free (diabetic safe), hypoallergenic, and do not contain oils. Pill Glide is now available for purchase at Walgreens, Publix, Kinney and select CVS pharmacy locations. FLAVORx is a global health care company, based in the Baltimore / Washington D.C. area, that has been helping people take their medicine since 1994. The FLAVORx Pediatric Flavoring System is available in nearly all major retail pharmacies, including CVS, Walgreens, Walmart, Target and Rite Aid, to name a few - as well as many local independent pharmacies - nearly 40,000 locations in all. Using FLAVORx's copyrighted flavoring recipes, pharmacists have safely flavored over 40 million prescription and over-the-counter medications for children, making it easier for them and their parents to deal with the stresses of being sick. Pill Glide expands FLAVORx's compliance-based offerings.